Aquation’s White-RAT Leaf Absorptance Meter provides a precise measurement of leaf reflectance and absorptance of white light (White-RAT, where RAT: Reflectance, Absorptance, Transmittance). Both leaf absorptance and reflectance are important attributes of leaves and other photosynthetic structures, as they influence the proportion of light ultimately entering the photosystem and either driving photosynthesis or contributing to photodamage. The Aquation White-RAT Leaf Absorptance Meter directs a white light onto the sample and measures both the proportion of that light transmitted through the sample (%Transmittance), and the proportion of light reflected off the upper surface of the sample at an angle of 45 degrees (%Reflectance). With no sample present, a value of 0% transmittance can be obtained using the black calibration standard supplied, and then a value of 100% reflectance can be obtained using the white calibration standard supplied. These values are then stored in the White-RAT until new calibration values are obtained. Values of %Transmittance and %Reflectance of a leaf sample are derived relative to these calibrated values, and %Absorptance of the sample is then calculated. Aquatic plants and algae can now be measured more conveniently with an improved water-resistant stage. This will help in rapid screening of multiple samples. The relative proportions of red, green and blue lights that are used to constitute white light can be varied. This means that leaf absorptance and reflectance can be determined for light of s spectral quality more closely matching that of the natural environment. For example a red-enriched light can be used to determine leaf optical properties in the early morning or late evening. Similarly, a blue-enriched light can be used to simulate light experienced by an aquatic plant or alga at depth, where most red light is attenuated by the water column. 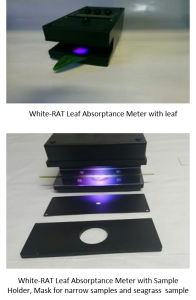 The White-RAT Leaf Absorptance Meter measures the proportion of light absorbed by the sample. Coupled with ambient light measurements, and the measurement of the effective quantum yield of PSII energy conversion, one can now easily determine the rate of electron transport (ETR) with improved accuracy. This is because the published average value for absorptance of around 84% can vary widely between samples, leading to significant over- or under-estimates of ETR. Using the White-RAT when conducting field or laboratory studies where ETR is calculated will necessarily increase the accuracy of ETR estimates.